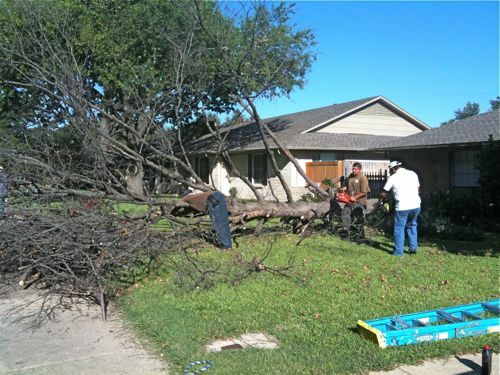 You probably couldn’t tell from the pictures I’ve shown you of the front of the flip, but there’s a ginormous dead tree smack dab in the middle of the front yard. While I love trees and hate to chop them down (my preference is to “make it work” like we did at our last flip), this sucker bit the dust a long time ago. The lack of a single leaf was a dead giveaway. It took a surprising long time for the guys to chop this tree into manageable pieces. This stump was quite a doozy. 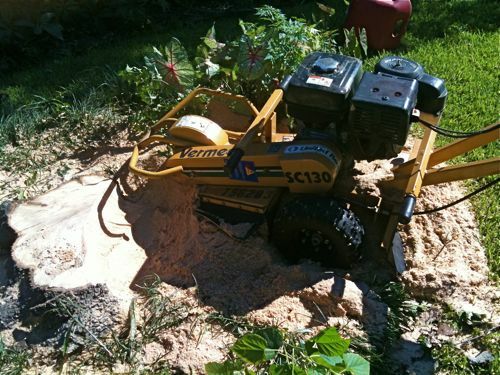 After about an hour of grinding away at it with this machine, about half of the stump was still left. But after another zillion hours, the stump was thoroughly annihilated and turned into sawdust. 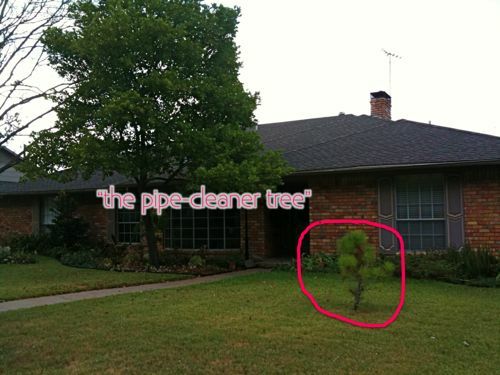 And do you remember our little friend the “pipe-cleaner tree,” as one of you so aptly named it? We had no mercy for that little guy either. I guess we’re ruthless like that. What’s your stance on chopping down trees? Should it only be reserved for the ones that are dead or dying, or do you think it’s okay to give’em the axe if they’re ugly or don’t work with the rest of your landscaping? 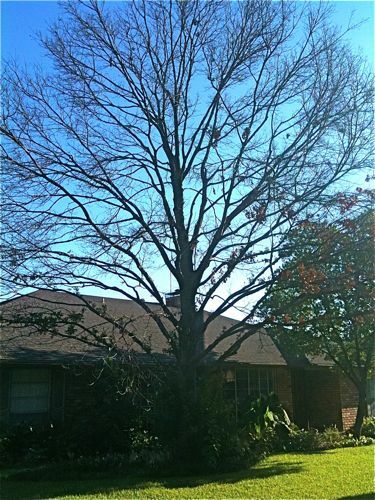 I really hate to have a tree cut down, but having an ugly tree is not a winning proposition either. We added on to a house and had to cut two large magnolias to make room. The neighborhood was up in arms. Later, we planted several trees, so maybe we have been removed from their Tree Asassins website. 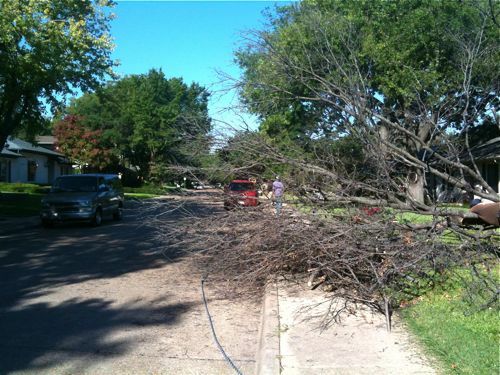 You were fortunate that high winds did not push your totally dead tree down on your house. Looks like the removal was a HUGE process. Makin’ progress on the flip! I’d totally cut down a tree if I just didn’t like it. Not very green of me, I know! 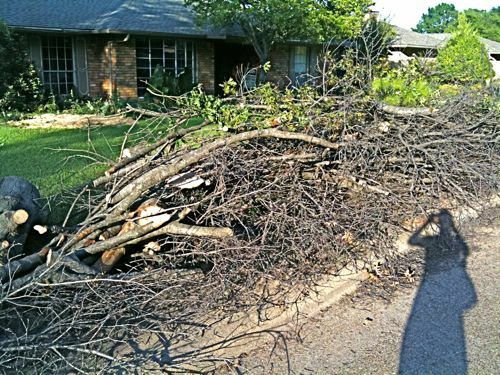 My parents cut down a tree that was MASSIVE a couple of years ago (well, they hired guys to do it) and it took forever too! I guess it’s just a long process! Hope the rest of your weekend went well!!! I’m like you, if the tree is healthy leave it — unless its super ugly or will grow up and be super ugly. 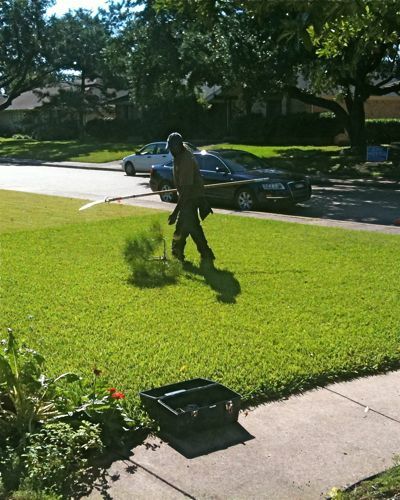 We have an ugly pine tree in our backyard……when the time comes that ugly sucker is going down! 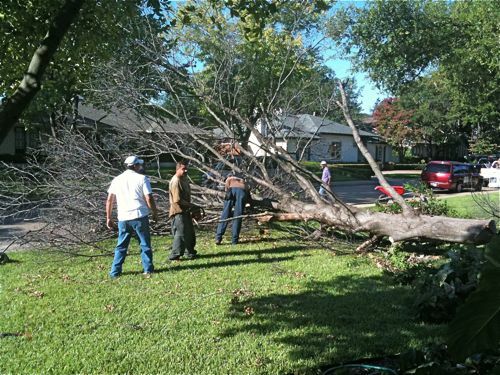 I truly love a big ole tree, but if it’s dead, it’s dead (and dangerous in a storm!). I think you made the right call here. Around here, trees are sacrosanct – in fact, I don’t think you’re allowed to cut them down – so many are ancient, ancient fir trees. There’s even a stump – not a tree! – a STUMP in our biggest city park that’s 800 or so years old and people have donated hundreds of thousands of dollars to save it. It’s a city treasure or something. Wonder what killed off yours? Maybe someone with a passive-aggressive streak who couldn’t cut down a live one? Heh. Is it much lighter inside now? A dead tree must always be cut down. That’s my thinking. It could fall down and damage the property or injure someone. I’m also for cutting down any tree that is leaning precariously to one side or the other. 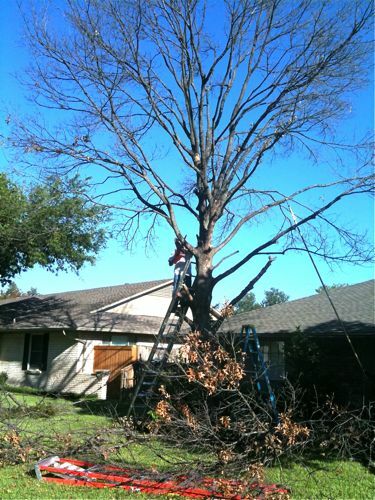 A healthy, properly growing tree is a keeper. I prefer trimming it to cutting it down.